ok ivy situation at the berry bed is nearly cleared now. so very close to finally transplanting the gooseberries, raspberries and blueberry. i'm told the blueberry won't really flourish unless it has fairly acidic soil, and indeed it hasn't so far, where it is.. i don't have a ph meter, but the patch where it has been so far is very composty, and full of nettles, so they're loving it, but the blueberry isn't. is there anything quick i can do as i replant it to increase the acidity a bit at its patch? looked a bit on the net but it's all about getting sulphur or something.. is there anything more organic and straightforward i can do, like certain types of composted stuff to bring the ph down a bit? 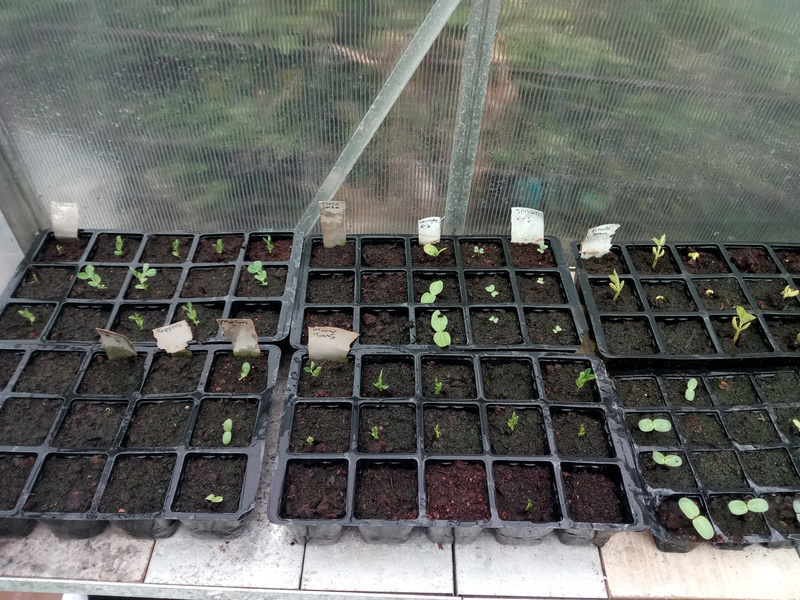 other than that, the germinating in the greenhouse is going well. i have healthy looking peas, french beans, mange tous, brussels sprouts and courgettes on the go. still waiting on the tomatoes and peppers to pop their heads up. 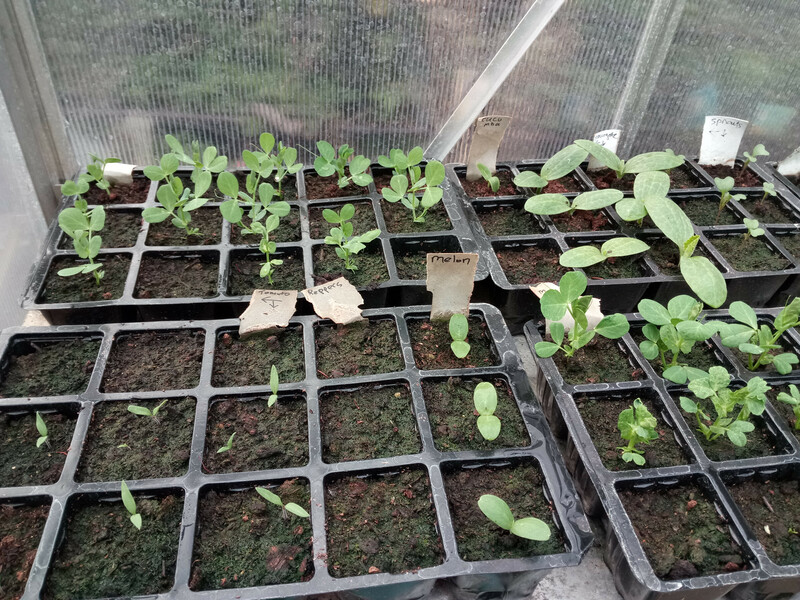 couple of melons have sprouted, so will see what i do with them.. and it looks like i'll have a heap of sunflowers to put about the place. that's about it for the updates really. good times. Very, very difficult to bring PH down to acidic levels. Easy to go the other way, though but that's no help to you. What most people do, is to dig a big hole and fill it with ericaceous compost to plant a blueberry in. cheers. i've certainly got compost to lose, so i'll just throw a load in and see how it goes. no major life catastrophe if it doesn't fruit like. 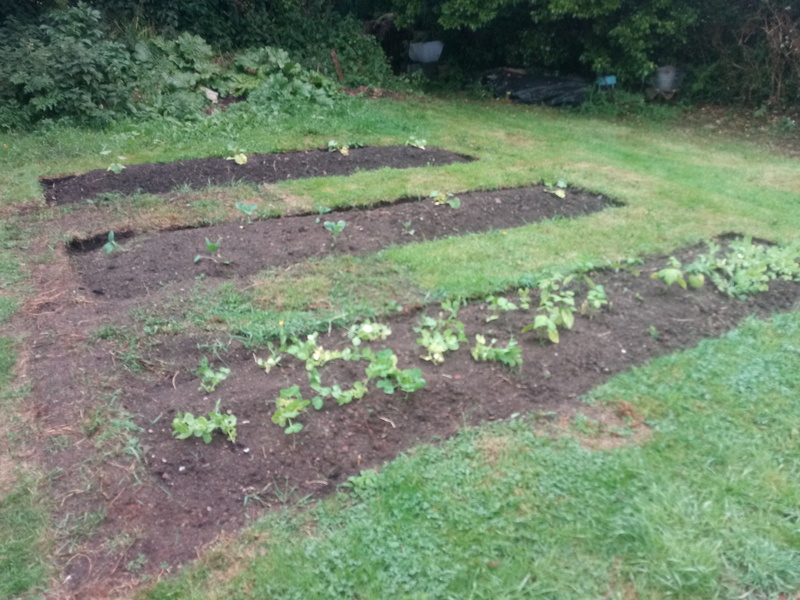 peas, french beans, sprouts, mange tous, courgettes, melons all looking good. more sunflowers than i'll know what to do with. tomatoes just today started to timidly poke their heads out. no sign of peppers or cucumbers yet. all good in the hood. A trick I used in my garden in England was to line the planting hole with tea bags! It worked a treat with azaleas. The soil there was quite fast draining and the tea bags slowed that down too. Here I found the ericaceous compost to be enough. But the blueberries were slow to start with. The older plants are doin fine - loads of flowers on them this year. ok so. berry bushes are in place. ivy situation is as good as it's going to get. 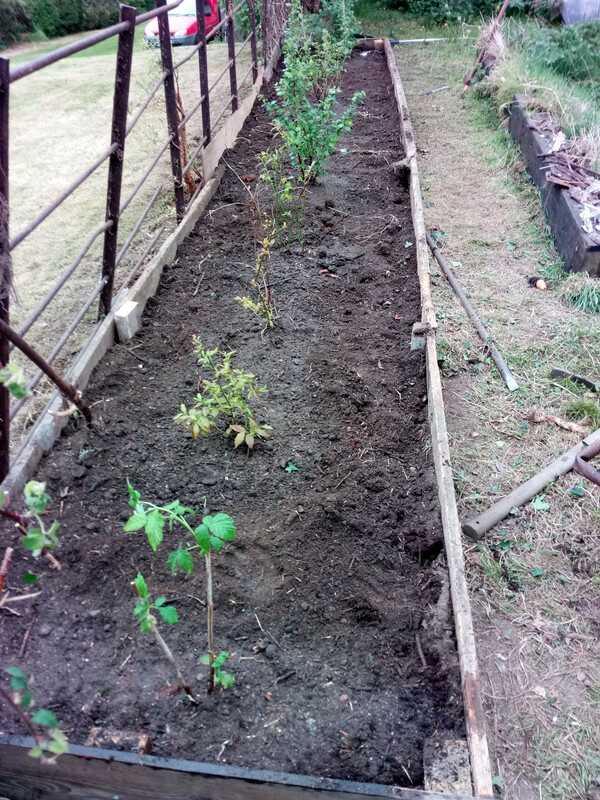 raspberry canes, some blueberries, and some gooseberries. and i tore apart the old stupid raised bed that was never really done right, and wasn't in the right place, so mowing now has less obstacles. 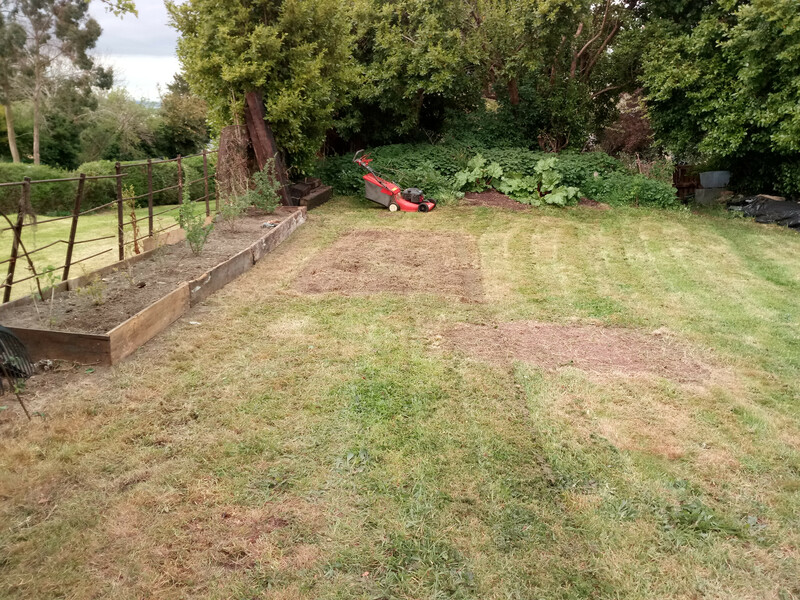 i do need to make a few new beds in this area though for all the stuff in the greenhouse i'll have to plant out soon though. hoping to do it all better this time. loads of sunflowers, and french beans in the background. kinda clockwise from top left..a good few peas, a single cucumber, 6 courgettes, 6 brussels sprouts, good few mange tous, 3 melon, 10 tomatoes have germinated. getting there. need to figure where to plant all that and dig the greenhouse properly. will probably do a round 2 of peas and beans once these are planted out. enjoying it all. have been ignoring the messier bit of the garden really. got a good length of pipe (about 40 meters) laid in the stream from the highest point.. need to get a bit more pipe (about another 40 meters i'd say) and then get an ibc mounted somewhere to fill. will be some good infrastructure when it's done. can run a few hoses around from there then. i do read the other threads, i just don't know much so i don't have much to add to them, but i'll get there in time sure. You are on a steep learning curve Cravings and your effort and enthusiasm is commendable. I second that opinion . You are ahead of me, I haven't even sown my peas yet! You're agreeing with me.... jaysus! Tatoes sown today, finally. Everything else can now follow. Including the peas. Peas up. Spuds through and earthed up. Broad Beans up. Swedes up. 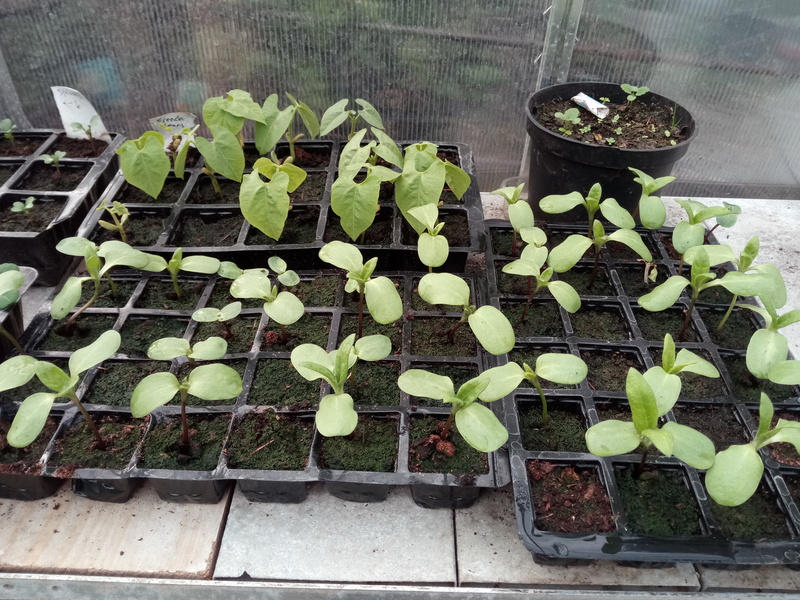 Runner beans up and transplanted. Leeks up (just). Onion sets growing nicely through my sheet of weed control fabric. Spring onions and spinach just showing. Come on Wexford. Digitus extractus. Lady F's got an excuse, being further north, so what's yours? A wet field Blowin, same excuse as every year. Actually this is the first year that we have the drills in in April. Twice in the last 5 years it has been early June. On a hill, marl underneath and springs. good stuff guys. i'm starting to harden my beans and courgettes and stuff. gonna need to plant them out soon i'd say. they're getting pretty big pretty quickly. dug some new beds and planted everything out. think it's going fine. i also have some apple trees now to decide where to put. good times.